In a dry location, use to connect two pieces of flexible armored cable (Greenfield or BX) to a steel outlet box or other metal enclosure, when using only one knock-out opening. UL Approved. 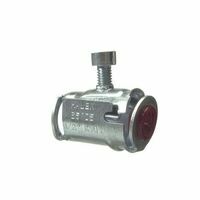 Halex MC Snap-In Connector, Flexible, 3/8 in Nominal, Steel, Includes: Insulating Bushing, CSA Certified, UL Listed, For use to connect aluminum or steel ac, aluminum mc, and steel flexible metal conduit, indoor use only Indoors or outdoors. To secure EMT conduit to a wood or masonry surface. Indoors or outdoors. To secure EMT conduit to a wood or masonry surface. Zinc die cast. In a dry location, use to connect flexible metallic conduit (Greenfield or BX) to a steel outlet box or other metal enclosure. Use to join two lengths of EMT conduit together. Zinc. UL, CSA Approved.